As you may know when you install Windows at first time, the first user you create, is the Administrator account. This is OK when you 're the only user on the PC, but if you share your PC with others or if you want to share your files on the network, then it's better to create new users for safety reasons. How to Add News Users in Windows 7 or Vista. Method 1. Create New Account using Control Panel. Method 2. Add Account by using the 'User Accounts' utility. Method 3. Add A New User using Command Prompt. Method 1. How to Create a New User using Control Panel. 1. Sign-in to Windows with an Administrator account. 2. Navigate to Windows Control Panel. * Note: If you want to assign Administrative privileges at the new user, check also the Administrator option. 7. Finally, if you want to specify a password for the new account, then click the new account and then click at the Create a password option to specify the password. Method 2. How to Add or Delete Users by using the 'User Accounts' utility. One of my favorite methods to add users (in all Windows versions), is by using the 'User Accounts' utility, which gives all the needed options to easy manage the users on the PC. (Add/Remove Users, Specify User Privileges or to Change User Password). 2. Press Windows + R keys to open the run command box. 3. In the "Open" box, type: control userpasswords2 & click OK.
4. In Users tab, click the Add button to add the account, that you want to have access to your files. 6. Then type a password for the new user and click Next again. Method 3. 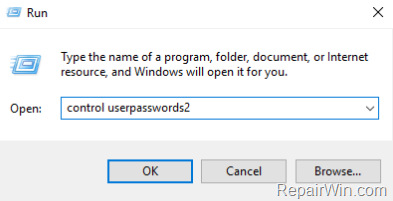 How to Add or Remove a User with Command Prompt in Windows 10/8/7 OS. The most easy method to add or delete users on Windows 10, 8, 7or Vista, is by using command prompt. * Note: At the above command change the fields "username" & "password", according your choice. You cover more useful info than I can find elsewhere.